I have read a bazillion of Robin Jones Gunn’s books. She and Frank Peretti are by far my favorite Christian authors. They are worlds apart, of course, but I love reading both of their work.The setting for a lot of Robin’s stories is beachy. They are perfect for vacation reads. They are lighthearted, sentimental and beautifully written. I’ve had a copy of Cottage by the Sea for a year or two, just waiting on the right time to read it. I read the ‘sort-of’ prequel to it, Love Finds You at Sunset Beach, last year on vacation and I absolutely loved it. 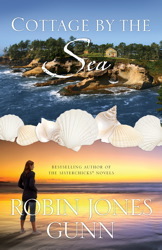 In general, I don’t read a lot of romance, but I make an exception for Robin Jones Gunn, and occasionally, Nicholas Sparks. (He is a North Carolina guy after all.) So…I took Cottage by the Sea to the beach with me this summer and got a surprise. This is NOT a happy beach read. This book is sad. I cried three times in the last few chapters. I don’t think I have ever cried reading one of her books. But it was such a good story that I didn’t mind. The story with Erin and her dad is so beautiful and realistic. Erin has just started a booming wedding planning business. Her son has just announced his engagement to a wonderful girl and all seems right with the world. Then she receives a phone call from her very cold and distant step-mother telling her that her father has had a stroke. Erin begins the very difficult balancing act of caring for her father, someone she always felt she was a disappointment to, and trying to maintain her work and family obligations at home. Eventually one of those things has to go. There is a great message in the book about thinking you have someone all figured out, judging them basically, based on the behavior they show you. Then later, sometimes too much later, you find out why. I’m really glad I read this one, I just wish I hadn’t read it for vacation. It’s going on the top shelf of my bookshelf, with my favorites.